The "Island", as it is referred to by locals, has had many visitors starting with the prehistoric people 3,000 to 7,000 years ago. Early residents of Marquette traveled there by boat since there was no bridge over the Dead River. Originally, it was designated as a government lighthouse reservation. Through the efforts of Peter White, a bill was passed on July 12, 1886, by the United States Congress deeding the Island to the City of Marquette. White built a road from the City to the park and planted the tall Lombardy Poplar trees which line Lakeshore Boulevard. Today, Presque Isle Park is Marquette's most beloved attraction, offering residents year-round outdoor recreation, serene settings for nature observation and education, and cultural experiences. Situated at the end of Lakeshore Boulevard, the showcase park is easily accessible by either the bike path or automobile. The park supports over 100 species of native plants and diverse landscapes including pebble beaches, rocky cliffs, bogs, and forest. 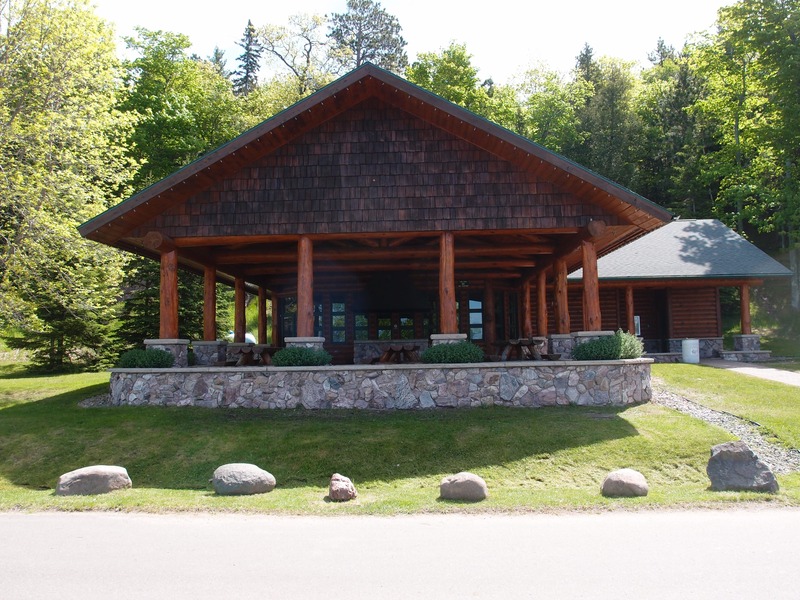 Major facilities at the island include two picnic areas, concession facilities (the Island Store), hiking trails, playground facilities, three drinking fountains, grassy open areas, a historic wood band shell for concerts, two sets of restrooms (serving each picnic area), an open air park shelter, and custom designed timber gazebo. The park is served by the John B. Anderton Trail System, winding through the interior of Presque Isle Park, and Peter White Drive covering the narrow outer perimeter of the Island. The scenic roadway was improved and repaved in 1999. Turnouts are provided at intervals for those wishing to stop and travel by foot on a portion or simply enjoy the scenery. The eastern coastline, filled with coves and ancient rock outcroppings, is best viewed from the outlook platform just north of the graves of Charlie Kawbawgam, the last chief of the local Chippewas, and his wife, Charlotte. Another attraction on Presque Isle Park is the white-tailed deer. This free-roaming band at times contains albino deer whose snowy-white coat dramatically contrasts with the typical brown coloring of the species. In recent years, because of artificially-provided food by park visitors and lack of predation and hunting, overpopulation of the deer, raccoons, and Canada geese have required culling, removal, and other measures to prevent over browsing and waste accumulation. Fishing opportunities are available at several spots in the park. As with most other fishing areas in the City, fishermen concentrate on spring and fall catches of native lake whitefish, lake trout and brook trout which were introduced for sport fishing. Most of the park's man-made facilities are concentrated near the park's entrance (a narrow area of land connecting the park to the mainland). Despite the seemingly large number of facilities described above, most of the Island has been kept out of development to preserve its natural beauty. Peter White Drive meanders through Presque Isle Park offering access to the many features of the park. The drive is open for park hours 7am to 11pm daily in summer months. During this time, the seasonal portion of Peter White Drive closes to vehicular traffic during Walking hours to allow for foot traffic. Winter hours at Presque Isle Park are 7am to 8pm daily. The seasonal portion of Peter White Drive closes to vehicular traffic when snow accumulation begins. The seasonal drive remains closed through the winter months. The main portion of Peter White Drive is plowed and open during park hours throughout the winter months. The seasonal portion of Peter White Drive will remain open to pedestrians through November 30, unless closed early due to accumulation of snow on the road. Section 28.10 *Animals Prohibited*. Animals are prohibited at the City's Presque Isle Park, unless confined to a motor vehicle, at all public bathing beaches, at Park Cemetery, and at any special events where signs are posted specifically prohibiting animals with the exception of leader dogs for the blind. 7 days a week 8 a.m. - 10 p.m.
Winter Hours: 8 a.m. – 9 p.m.
Staff will open and close the pavilion according to the rental hours scheduled with the Parks and Recreation Department. Set-up and take-down time must be within the scheduled rental hours. There will be no early set ups or late take downs unless additional time is purchased. The inside capacity of the pavilion is 68 persons, as set by the fire code. An additional capacity of 68 is permitted for the open porch area. The pavilion offers five 60-inch circular folding tables, four 8-foot folding tables and 68 folding chairs. It is the renter’s responsibility to set up and take down these items. The tables and chairs provided by the City are not to be removed from the building. There is a small kitchen area that contains a stove, sink, microwave and refrigerator. It is the renters responsibility to provide their own cooking utensils, silverware, service ware and linens. The stove, refrigerator and sink must be cleaned after your rental. A beautiful gas fireplace is available for your use on the east side of the pavilion. The outside capacity, under the canopy, is 68 people. This number is set by fire code. Permanent beautiful half log picnic tables have been installed for your use. Due to the size of the tables, we require that they not be moved. A large charcoal grill is available for use, the renter must provide their own charcoal. There is no smoking allowed in the pavilion or under the pavilion canopy area. If you decorate the pavilion, please use potted plants. No staples, tacks, tape, glue, nails or screws. Please do not adhere items to the pavilion structure. Vehicles are prohibited from driving on the grass or paved brick and from blocking any roadway. Additional parking is available near the Island Store. If you have a disability and require assistance to participate, please provide advance notice. Staff will open and close the pavilion before and after your event. There is not a speaker system at the pavilion. Alcohol may be consumed at the Pavilion with a special alcohol permit obtained through the Parks and Recreation Office. Hours available May - Oct, 7 days a week 8 a.m. -10 p.m.
*New to Bandshell audiences in 2018 will be the addition of 40 brand new benches, offering fresh seating for up to 80 patrons. This purchase was made possible by the support of the Michigan Council for Arts and Cultural Affairs and the National Endowment for the Arts. Hours available May - Oct., 7 days a week 8 a.m.-10 p.m.
Has 4-6 picnic tables, 3 grills, 2 electrical outlets, and a water spigot. Security deposit will be refunded provided the area and facilities are left in the same condition as when you arrived. If temporary structure is used, a non-refundable fee of $150 is due in addition to the facility rental. 10 days or more ahead of schedule date, a full refund of the hourly fees will be made less $20.00 fee. 2-9 days ahead of schedule date, 50% refund will be given. Less than 48 hours notice, there will be no refund.